Theatre Is Easy | Reviews | Philadelphia, Here I Come! John Fennessy, Daniel Leonard, and Jackson Mercado in Philadelphia, Here I Come!. Photo by Al Foote III. 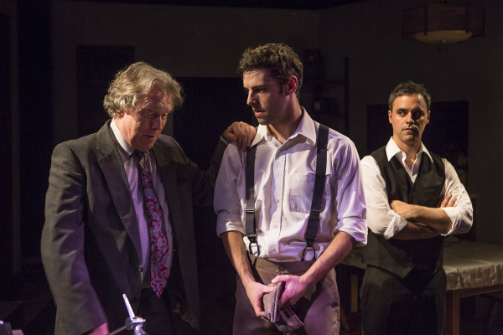 BOTTOM LINE: A serviceable yet emotionally distant revival of Brian Friel’s pensive comedy on leaving home. If we’re to believe all those old adages, our home is an important place. It’s where the heart is. There’s no place like it. And, perhaps most significantly, it’s where our story begins. So what are we to do when we want to start these stories over, when we crave a fresh beginning and a new lease on life? In Philadelphia, Here I Come!, Brian Friel’s 1964 comedy currently being revived by T. Schreiber Studio & Theatre, the answer is simple: look towards the city of brotherly love. Originally performed in the States nearly fifty years ago, Friel’s script holds up remarkably well in T. Schreiber’s production -- though this is most likely due to the universality of its plot rather than to anything else. Philadelphia, Here I Come! chronicles the final hours of Gareth “Gar” O’Donnell in his native Ireland as he prepares to emigrate to Philadelphia, optimistic that a new life across the pond will release him from the stagnancy that plagues him at home. Friel’s writing is laudable for its tender understanding of the emotional turmoil that characterizes new beginnings, most evident in a series of monologues that beautifully capture the nervous excitement and apprehension that comes with leaving home. One of the more interesting conceits of Philadelphia -- and certainly one of its most challenging -- is that is central character, Gar, is portrayed by two actors: one inhibiting the “Public” Gar (the one that “people see, talk to, talk about”), and the other portraying the “Private” Gar (the “unseen man, the conscience, the alter ego”). Any production would likely fall flat should these dual interpretations of its protagonist stumble; fortunately for this revival, both Daniel Leonard and Jackson Mercado are generally up to task. As Gar Public, Leonard is endearing and earnest, even if he is a bit aloof. Mercado, meanwhile, manages to overcome Gar Private’s more grating moments with his heartfelt delivery of a series of monologues that detail Gar’s searing personal battles. Among the supporting players, Lucy Avery Brooke fares best as the O’Donnell’s housekeeper Madge, providing this production’s funniest moments while simultaneously maintaining a hold on the tragic undercurrent that subtly structures the entire piece. Also impressive is John Fennessy as Senator Doogan, father to Gar’s former girlfriend, whose brief appearance in the first act was memorable enough to weigh on my mind throughout the duration of the performance -- just as it undoubtedly did on Gar’s. While director Jake Turner has done a commendable job honing in on some of the play’s more dramatic moments (his treatment of its finale, for example, is particularly well done), he fails to thoroughly craft an emotionally resonant production that is haunted both by the damage of Gar’s past and the uncertainty of his future. Likewise, Gilbert “Lucky” Pearto’s lighting design muddles any commentary on the power of memory as it fails to effectively distinguish several flashback sequences from the play’s overall narrative. D. Schuyler Burks’s spatially exciting and appropriately plain scenery, on the other hand, truly succeeds at visually capturing the tone and structure of Friel’s writing. In Philadelphia’s final moments, Gar Private implores his Public self to “keep the camera whirring” in his mind, to take in everything as he prepares to leave home. T. Schreiber Theatre’s revival may suffer from a few missteps, but there’s still much to take in, and even much to enjoy. Just be sure to keep your own camera whirring throughout the performance -- or you might be quick to forget it.